Tahiti Park Neighborhood Association President Jen Ahearn-Koch, attorney Hagen Brody and businessman Martin Hyde are headed to a May 9 runoff for two at-large City of Sarasota Commission seats. They proved themselves the top three vote getters during the March 14 regular election. Ahearn-Koch captured 21.8% of the vote total with 2,716, unofficial results show. 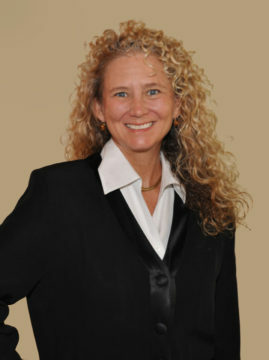 A former city Planning Board member and chair, she owns JAK Consults, a marketing and consulting firm. She also has become a leader of the STOP! group that is seeking more public involvement in the approval process for new development and means of decreasing traffic on heavily congested city roads. 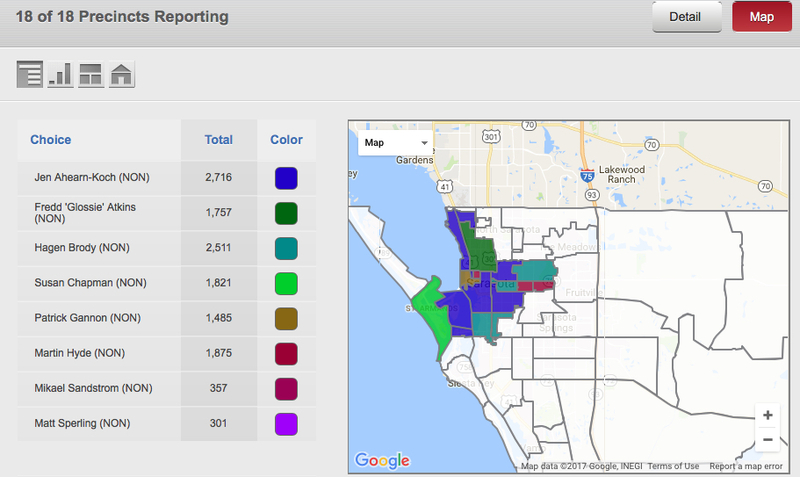 Brody, a former state prosecutor, was in second place with 2,511 votes, which was 19.58% of the total, according to the unofficial results posted by the Sarasota County Supervisor of Elections Office. Hyde won 1,875 votes, for 14.62% of the total, the unofficial returns show. He is president of Gulf Business Systems, an information technology and services firm established in 1972 that he purchased in 1999, according to his LinkedIn profile. He bought Gulf Business Systems after selling his family firm in the United Kingdom to a public company, he told The Sarasota News Leader. He was the first to file for one of the at-large seats, doing so on Sept. 9, 2016. Hyde narrowly beat out incumbent Susan Chapman, who took 14.2% of the votes: 1,821. In early voting results — posted on the Supervisor of Elections Office website before the polls closed at 7 p.m. on March 14 — Ahearn-Koch was leading with 1,353 votes, for 19.91% of the total cast by that point. Brody was in second with 1,256, followed by Chapman with 1,023 and Hyde with 1,016, the records show. An attorney, Chapman has been at the center of two community controversies. The older one involves a meeting organized by business owners in downtown Sarasota in 2013 to discuss concerns about homelessness. Both Chapman and Commissioner Suzanne Atwell attended the session, which was not advertised as open to the public. The nonprofit group Citizens for Sunshine brought suit against both women and the city, arguing that because the subject matter related to an issue that was “reasonably foreseeable” to come before the City Commission, the lack of notice and taking of minutes violated the Sunshine Law. While Atwell — who did not admit any guilt — and the city settled with the organization, Chapman denied any wrongdoing and insisted on fighting in court. At one point, the City Commission stopped paying her legal fees; however, with two interim city commissioners on the board in 2015, the majority chose to resume those payments. Citizens for Sunshine has pursued an appeal of a 12th Judicial Circuit Court judge’s decision that Chapman did not violate the Sunshine Laws by attending the meeting. Orange has become a detour for drivers seeking to stay off Tamiami Trail while Osprey Avenue has been closed since last summer for the Lift Station 87 project. Chapman at first told reporters that she was being sarcastic. Later, she apologized publicly. Patrick Gannon, a Planning Board member and president of the Downtown Sarasota Condominium Association: 1,485; 11.58%. Former Mayor Fredd “Glossie” Atkins: 1,757; 13.7%. Businessman Mikael Sandstrom: 357; 2.78%. The total number of votes cast was 7,186, the unofficial results show. Turnout was 19.12%. A total of 37,579 people were eligible to cast ballots, the elections office data shows. During the 2013 general election for the two-at-large seats, the voter turnout was 17.34%, Supervisor of Election Office records note. At that time, 35,480 people were registered to vote in the city. During the May runoff in 2013, turnout increased to 19.97%, the records say. During the last regular City Commission election — held in March 2015 — turnout was 21.87%. With the May 2015 runoff, however, voter participation dropped to 18.7%, elections office records show. The last day to register to vote for the May 9 runoff is April 10, Supervisor of Elections Ron Turner points out.